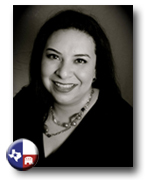 Amanda Adamez is a conservative activist from Beeville Texas. She graduated from AC Jones High School and received her undergraduate degree from the University in North Texas in Denton. Amanda has served as Chairman of the UNT College Republicans, State Secretary, and State Chairman of the Texas College Republicans. In addition to her positions on the state level, she has also served as Southern Region Secretary of the College Republican National Committee. Amanda was also selected as an Eagle Forum Collegian and was a presenter at the Eagle Forum Collegians Summit with Phyllis Schlafly in Washington DC. Amanda has also been interviewed in multiple media forms and speaks to various conservative clubs about youth and Hispanic outreach. She has volunteered her time to campaign for candidates in local, state, and national races and served as the Texas Campus Coordinator for Young Americans for Romney. Aside from her activism in politics, Amanda is an award-winning short story author and has been published in literary journals for short fiction.